1. Who are you, anyway? I’m Robert Lopresti, a librarian and author in Washington state. 2. How do you pronounce your name? 3. Last name, you idiot. Sorry. Low-PRESS-tee. And by the way, the title of the book is GreenFELLAS, not GreenFELLOWS. 4. What is your writing experience? I first submitted a story for publication in 1976; actually sold one three years later. I have had more than fifty mystery stories published in Ellery Queen’s Mystery Magazine, Alfred Hitchcock’s Mystery Magazine, The Strand, etc. 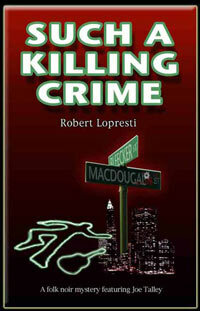 My first novel, Such A Killing Crime, was published by Kearney Street Books in 2005. A collection of stories, Shanks on Crime, came out last year. Two Derringer Awards for best mystery stories. One Black Orchid Novella Award. Also, an Anthony Award nomination. Oh, and a third Derringer finalist story. 6. What’s your book about? Greenfellas is a comic crime novel, with issues. Sal Caetano is happy being the brains of a New Jersey Mafia family, until the day his granddaughter is born. While he’s celebrating that news he hears on the news that by the time she goes to college climate change will make the world a disaster area. So Sal decides to fix the environment, using all his mob skills. Along the way he copes with rival gangsters, crooked politicians, and ecoterrorists. 7. Why did you write this book? I am the environmental science librarian at a university. Working with students who are trying to make the planet a better and healthier place made me wonder what I could do to help. I don’t have the skills to study, say, paleoclimatology, but I do know how to write crime fiction. 8. You live in the northwest. Why set the book in New Jersey? I was born in Plainfield and lived in the Garden State until I was thirty-three. And N.J. and the mob just seem to go together, don’t they? 9. Where can people find your stuff for free, to see if they like it? You can find a sample of GREENFELLAS at Amazon. And here is a short story for free. 10. Has anyone offered comments on the book so far? Kings River Life Magazine listed it as one of the Best Mysteries of 2015. “A funny, fast-paced crime story whose serious points pack the wallop of a forty-five.” -Terence Faherty, Shamus-winning author of the Scott Elliott series. 11. Has anyone said they hated it? 12. If this isn’t too personal a question, do you blog? I do. I write about crime fiction every other Wednesday at SleuthSayers. On Sunday I review the best short story I read that week at Little Big Crimes. And at Today in MYSTERY HISTORY I write about some event that happened each day in our field. If you are desperate for more news about me go to Robert Lopresti’s Author News. 13. What else is interesting about you? 14. If you are so damned concerned about the environment, how do you commute to work? Bicycle, twenty-seven years now. Wanna race?